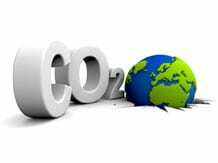 Carbon dioxide emission image via Shutterstock. Greenhouse gases were the driving force behind global glacier retreat at the end of the last Ice Age, echoing current climate change, according to a study published today. More than 11,000 years later, the researchers say, global warming is on track to wipe out 80-90% of remaining glaciers within a few hundred years unless carbon dioxide emissions are held in check. Such an outcome would push sea level rise and rob hundreds of millions of people in Asia and South America of a critical source of water. Using new techniques to resolve an old debate, researchers showed that it was a 55% increase of CO2 in the atmosphere -- from 180 to 280 parts per million (ppm) -- over some 7,000 years that melted the world's glaciers to a level that remained stable until the start of our industrial era. Higher levels of green house gasses, such as CO2, trap more of the Sun's heat on Earth causing global temperatures to rise. Up to now, scientists disagreed on the cause of Ice Age glacier decline, with some attributing it mainly to solar radiation and regional influences such as ice sheets and ocean currents. A team of scientists led by Jeremy Shakun of Boston College re-examined the ages of more than 1,100 previously studied glacial boulders by measuring a particular isotope -- Beryllium-10 -- produced by exposure to cosmic rays. They compared their findings, the most accurate so far, to the timing of the rise of carbon dioxide in the atmosphere, data gleaned from ice bubbles trapped in ice cores. "The only factor that explains glaciers melting all around the world in unison during the end of the Ice Age is the rise in greenhouse gases," said Shakun. Scientists are still not sure what triggered the gradual release of CO2 into the atmosphere starting 19,000 years ago, or exactly where it came from. "It's fair to say that the reason CO2 went up and down over the Ice Ages is one of the biggest palaeoclimate mysteries out there," Shakun said by email. The most likely scenario, according to co-author Peter Clark of Oregon State University is that huge quantities of carbon bubbled up from the sea.